The history of SIM Malawi is woven together from two cords: the history of the Africa Evangelical Fellowship (AEF) and that of the Sudan Interior Mission (SIM). In 1889 Martha Osborn, Spencer Walton and Andrew Murray founded in Cape Town, South Africa, the Cape General Mission (CGM), soon to become the South African General Mission (SAGM) as the work expanded to other parts of southern Africa. By 1900 there were some 100 workers. SAGM spread into most of the African countries south of the Equator, including Malawi. In 1968 the name was changed to Africa Evangelical Fellowship (AEF) to reflect this growth. Amongst others, the Africa Evangelical Church (AEC) grew out of the work of AEF. Coming from South Africa, missionaries from SAGM entered Malawi in 1900, some 50 years after the first missionaries entered the country in the footsteps of David Livingstone. The work started out from Port Herold, today Nsanje, a district at the southern tip of the country. Those early missionaries began working primarily with members of the Sena people group. 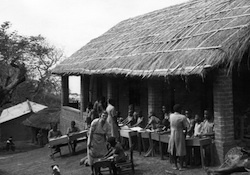 Between 1900 and 1960, the mission worked throughout the Lower Shire in education, health care, and building a strong, Christ-centered Church, which became the Africa Evangelical Church (Malawi). Both the Africa Evangelical Fellowship and the Africa Evangelical Church became registered in Malawi in 1967. In 1893 two Canadians, Rowland Bingham and Walter Gowans, together with an American, Thomas Kent, arrived in what is today Lagos, Nigeria. Although the oldest was only 25, each man burned with the desire to establish a Christian witness in the ‘Soudan’ region of Africa. In those days ‘The Soudan’ was a geographical term used to describe a sizeable portion of Africa south of the Mediterranean countries and stretching from the Atlantic Ocean to the Red Sea. Within a year malaria had claimed the lives of Gowans and Kent. But Bingham persevered. In 1902 a base was finally established 500 miles inland. 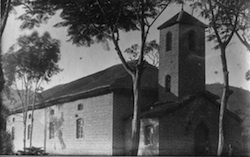 From that base the Sudan Interior Mission (SIM) was founded and branched out into other countries in West Africa, and then in the 1920s, to East Africa. SIM grew significantly by joining forces with other missionary organisations, such as the Andes Evangelical Mission (AEM) in 1982 and the International Christian Fellowship (ICF) in 1989, extending its work also to South America and Asia. Likewise, in 1998 AEF merged with SIM. Today, SIM is a major international and interdenominational Christian mission organisation, with headquarters in Fort Mill, South Carolina, USA, and sending offices on every continent. Its work now embraces more than 43 countries, with about 1,600 missionaries from more than 35 different countries serving worldwide. After the merger between AEF and SIM, the mission registered in Malawi in 2002 as the Society for International Ministries, thus retaining the SIM acronym. SIM Malawi continues to work in partnership with the AEC, offering assistance in leadership training and growth in various ministries, while at the same time encouraging church independence. Consequently, we were, for example, co-founders of the Evangelical Bible College of Malawi in 1964 in Blantyre as well as the Evangelical Association of Malawi in Lilongwe. Building on this rich history, and as we move forward, SIM seeks to partner with the Malawian Church and like-minded organisations as we share the love of Christ in Malawi and beyond in both word and deed.